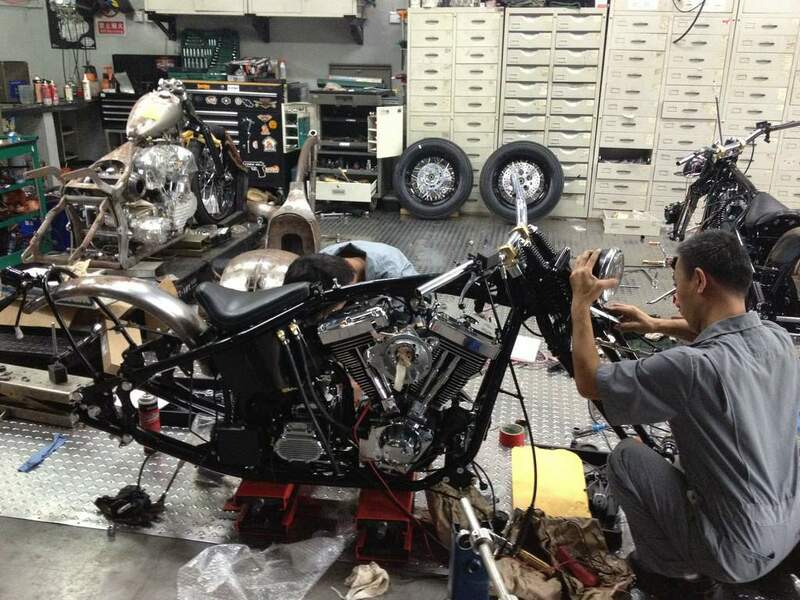 Because of the growing demand in the early 80s for high powered sports bike engines Honda embarked on a mission to try and achieve an engine that would display both high power output and driveability over the entire revolution range. So following a feasibility study, Honda’s research and development team set on course to achieve a 200HP per liter power output and stable idling. The team discovered they needed to come up with a method to counteract the air inlet resistance from low to medium engine revolutions. The solution arrived through the REV (Revolution-modulated valve control) valve pausing mechanism. The system had the task to forcibly stop multiple valves when needed in order to optimize airflow and achieve a stable idling and increased smoothness for low to medium engine operation. The first production motorcycle marketed with the new REV system was the CBR400F in 1983. From the REV used in motorcycle engines, Honda developed the VTEC valve actuation system for automobiles by building on the idea to have both variable valve opening times and two camshaft profiles: for low to middle engine speeds as well as for middle to high engine speeds. The first Honda automobiles to receive the VTEC system were the 1989 JDM-spec Integra and Civic CRX SiR, which used a 160 hp B16A DOHC engine. The American market received the VTEC system in 1991 with the Acura NSX supersports car which used a DOHC VTEC V6 unit which developed 270 hp at 7100 rpm. Initially designed for DOHC (Double Overhead Camshaft) gasoline engines, Variable Valve Timing and Lift Electronic Control has the role to switch between fuel saving operating mode to performance operating mode. This is done by running in a low speed valve timing and small cam profile at low engine speeds for improved fuel consumption and leaner fuel burning. On the other hand, when the engine needs more power a higher output is achieved through the VTEC system by speeding up the valve timing and switching to the larger cam profile which allows for a further and longer valve opening time. The switch from the low profile cams meant for improved fuel consumption to the high profile cams meant for increased power output is done via a locking pin which connects the two independent cam lobes at a certain engine speed. Now depending on the engine’s characteristics this can be set to occur further up the engine range or lower for increased torque but poorer fuel savings. On the returning phase, when the engine switches from high profile cams to the low profile ones, the pin retracts at a lower engine speed than when it first activates in order to avoid the engine running around VTEC activation border. The VTEC system works much in a way as a mechanical compressor or turbocharger would, by creating a high swirl effect and excellent filling efficiency materializing in higher power output. In terms of reliability, most of you have probably heard in the news regarding the automotive industry that Japan's second largest car maker has an outstanding positive record in this respect and the VTEC units are no exception from this rule. Honda has developed several VTEC variations over the years, altering the valve system to suit different engine output or fuel consumption requirements. 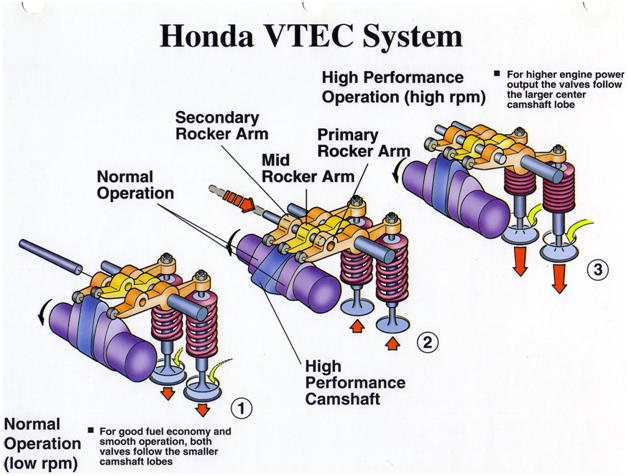 The VTEC system can also be applied to SOHC (Single Overhead Camshaft) engines, but loses the high profile cam advantages on the exhaust side, as there is only one camshaft to activate the lift. So, even with further developments the SOHC engine can benefit from the VTEC system only during either the intake or exhaust side. The sixth generation VFR (for the first time marketed only as the "Interceptor" in the USA and simply as the "VFR" in Japan) was introduced in 2002. For the first time it featured dual underseat exhausts, an optional anti-lock braking system (ABS) in addition to the LBS/DCBS, and optional hard luggage. It featured chain-driven cams rather than the traditional VFR gear-driven cams, and was the first non-JDM motorcycle to have Honda's VTEC valve-actuation technology. The implementation of VTEC was seen as a bid by Honda to meet tightening noise and emissions standards in Japan and abroad while improving the peak horsepower of the engine. Similar to the automotive version of VTEC-E the simplified motorcycle version of VTEC employs only two of the four valves per cylinder when operating at lower engine speeds. All four valves per cylinder are engaged above approximately 6,800 rpm. This is initiated by an electronically actuated oil spool valve, which send oil pressure to the lifter actuators, which then move the engagement pins into place above the valve stem, allowing the remaining two valves to open. This design allows for variable valve timing as well, since the cam lobe profiles can be made different. After some criticism of the abruptness of power transition, Honda lowered the VTEC activation rpm threshold to 6,400 rpm in 2006. The VTEC disengages two cylinder valves when the engine speed drops again below 6,100 rpm.